Write it down: Involving patients in charting is a win-win. Engaging patients in their own care is by no means a new concept. But with the signing into law of the Affordable Care Act in 2010—with emphasis on patient engagement and shared decision making— the effort has become more widespread. While there are many ways patients are becoming more involved in their care, the idea of patients participating in the charting process is a relatively new strategy. Despite being a concept without a track record, patient participation in documentation has the potential to be a difference maker. For Stephanie Drobny, MS-HSL, RN, CPHQ, regional senior manager for outpatient oncology and infusion at three hospitals in the Banner Health System, getting patients involved in the charting process has been an eye-opener. She started doing it on her own and then decided to present the idea to her unit. From there she expanded the effort during a master's project on communication as leaders. Since then, Drobny has been on a crusade of sorts, sharing her experience and promoting the benefits of such an initiative. Feedback has been overwhelming, she says, noting that one physician told her that it's amazing something "so simple could be so profound." "It's a new concept, but as we move health care forward we need to start addressing the relationship between nursing, providers, and patients," Drobny says. "We should not ultimately be the ones who manage patients' care—they need to learn to manage their own care. And what better way to start the process than to involve them during the charting? Part of the way we can empower patients to be more involved in their own care is to ensure they're getting all their health information presented to them in a way that they understand. Discussing this information while charting can be very effective." Drobny first began involving patients in the charting process in 2013. It all started with a patient who, according to Drobny, "grumbled that he didn't trust nurses because they were always talking behind his back." She realized the patient was describing the charting process, which he viewed in a negative light. This left a lasting impression on Drobny, who began seeing the documentation process from a different perspective, in particular how patients could view it as secretive or alienating because they are often left out of the loop. Previous patient experiences and even popular media may contribute to the general idea that medical records belong to the provider and are off limits to the patients themselves. For example, an episode of Seinfeld touched on the subject when Elaine, upset that she may have been labeled a "difficult patient" in her chart, attempts to sneak a peek at her records. The storyline worked to great comedic effect because most patients—especially at that time—felt awkward in asking to look at their charts. Instead, they'd rather act like two-bit prowlers to gain access. While that episode, which aired in 1996, may not ring as true today, it resonates with many viewers. Despite the advances made in terms of patient engagement, documentation processes tend to be one-sided in favor of the provider. Drobny says the manner in which charting is conducted can send a message to patients—positive, negative, or neutral. Not all patients care to be involved in the process, but that doesn't diminish its importance, she notes. While it may be perceived negatively, Drobny says the silence involved when charting in front of a patient is never meant to feel alienating. Instead it has always been a matter of efficiency, she says. "I don't think there was ever any intention to make the charting process feel secretive," Drobny says. "Charting used to not even be done in front of the patient, but there certainly was never any malicious intent in that either. It has always been more about getting the task done efficiently." As more charting occurs in real time—often in front of the patient—Drobny says it presents an excellent opportunity to involve patients in the process. When Drobny's patient commented about feeling as though nurses were talking about him behind his back, she knew it was time for a change—and all it took was a slight adjustment to result in big gains. Instead of sitting bedside facing the patient with her workstation on wheels by the patient's head (facing her), Drobny turned around the computer and sat side-by-side with the patient. With herself and the patient looking at the screen, Drobny went through the questions one-by-one. "By involving the patient in the task of documentation, I am making them the primary focus and at the same time educating them," she says. "I'm not turning my back to them and leaving them out of the process but making them feel a part of it." As patients become more involved in their health and spend time accessing their medical records, Drobny says it makes sense to involve them more at the charting stage, adding that it can become an essential component of a larger patient engagement strategy. However, if patients fail to comprehend the data contained in their records, it defeats the purpose. Getting patients involved at the time of charting can help facilitate better understanding of health information, Drobny says. Betty Schulte, president of coding and revenue cycle management operations for iMedX, believes partnering with patients is a feasible model in most circumstances with the potential for long-lasting benefits. "The idea of making patients partners in real-time charting is a unique venture that has the potential to make a very positive impact on the patient population and health care in general," she says. "I would hope this model is allowed to be considered feasible at all facilities. As pointed out in the American Journal of Nursing [where Drobny chronicled her experience], it may extend initial patient assessment time a bit, so the big question will be: Is the additional time worth the positive patient feedback to the facility?" According to Drobny, it takes approximately 20 minutes to conduct the charting process with patient involvement, an increase over what is typically allotted at the patient's bedside. "Undoubtedly, the time we're able to spend with patients is going to be a barrier to adopting this method," Drobny says. "We tend to be focused on productivity—which is, of course, important. But if we don't give that extra time to truly be able to connect with a patient and provide mentorship in their health literacy, then how can they learn to manage their own health?" After her initial session cocharting with that disenchanted patient, Drobny felt as though his health literacy had dramatically improved and he better understood his illness. In such cases, that extra time on the front end could save countless hours on the back end, she says. Debra Primeau, president of Primeau Consulting Group, says there's a large distinction between involving patients in charting and actually having them do their own charting. At the end of the day, it is still the provider's primary responsibility to enter the information. But Primeau says a model such as Drobny's is certainly feasible. 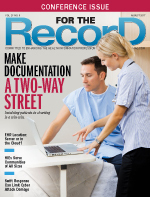 "There has been a lot of discussion, mostly positive, about having patients more engaged in their health care and included in the documentation in their record," Primeau says. "This helps with collaboration of care, better outcomes, and better accuracy of the documentation. The clinician is still ultimately responsible for the actual documentation, but with the patient involved in the process through active discussion, the end result is better for everyone." By all accounts, increasing patient involvement in the charting process can be accomplished in any documentation environment. For example, because the patient isn't actually documenting, Primeau says the type of EHR shouldn't matter. "The caregiver is still the one who is entering the documentation. The difference is the patient is actively involved in the process and is better able to ask questions and understand what is being asked and will be much more engaged in their care," she says. Drobny agrees, noting that any EHR is suitable. However, she would like to see vendors adopt tools that would help encourage and facilitate patient engagement. "I think we need a change in perspective about whom vendors are building the system for," Drobny says. "They're built for regulatory compliance, and that can't change, but perhaps we can take a cultural look at how things are done and have at least one section focusing on mentorship with the patient. I think that could be a great selling point for future systems as we move forward in this new era of health care." She says devoting one EHR screen or page to the patient would be a huge boost in terms of mentoring patients in their health management, noting that adding the capability to print would add to the benefits. "We do a lot of [mentoring] at the discharge process, but that's when the patient is leaving us," Drobny says. "If there was a way to get them information in the form of a readable print-out that follows through their hospital stay or acute experience, that would really help patients come to understand their health." Making screen formats more patient friendly— specifically a stronger focus on "readability"—would also be a game-changer, Drobny says. "Patients should be able to look at the screen and understand what it means," she says. Drobny also suggests EHR vendors develop a screen/page that ties everything together, an overview of the patient's current health status that would improve health literacy. Most industry experts agree that the number of patients engaged in their own care will grow exponentially over the coming years. Involving patients in documentation can be one aspect of the bigger picture as providers work more closely with consumers to help them take charge of their own health. Since going public with her ideas, Drobny has received sufficient feedback to make her believe the industry is indeed headed in that direction. The gist of the feedback has focused on the need for more widespread adoption of patient-centered charting and acknowledgement that patient engagement should be a top priority. "I think that involving patients in charting should be the future of health care," Drobny says. "Patients should be able to manage their own health, and if we're not educating them on how to do that, then we become barriers. I think that involving patients in charting should become part of the culture, so it's almost like second nature to turn the screen around and fill out information alongside the patient. Ultimately we should be partnering with patients in their health care, not controlling their health care."